My youngest kid cracks me up. She is often quirky, but also wise. As an artist, she finds that spending too much time online saps her creative energy. But she is on applebook. 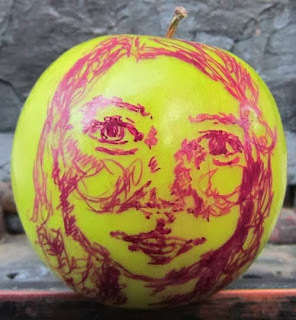 She doodled a self-portrait on a Granny Smith the other day. I want to be more like her, and balance my time and creativity, and be willing to be set apart. I love this! My first thought was, "How did she manage to do all that without breaking the apple skin? Or if the skin was tough enough, how did the ink actually stick?" Made me think I probably wouldn't try. Your daughter is clearly in touch with her dream kid - that's so awesome! I know, Edee! Thanks! I learn a lot from her, and I keep learning.